HomeCan a wound dressing colour change indicate infection? Can a wound dressing colour change indicate infection? For many years, diagnostic labs have used colour change as a marker for the growth of specific microbes. Think of all those chromogeneic agar plates that your lab goes through each day. And there are all sorts of broths that change colour in response to specific chemical changes caused by microbial growth. One of the first projects I was ever involved with was environmental sampling for MRSA at Lewisham hospital, where we used a selective broth that turned bright yellow when MRSA was present. So in a way, it is surprising that this approach has not been adopted as a marker to indicate wound infection. 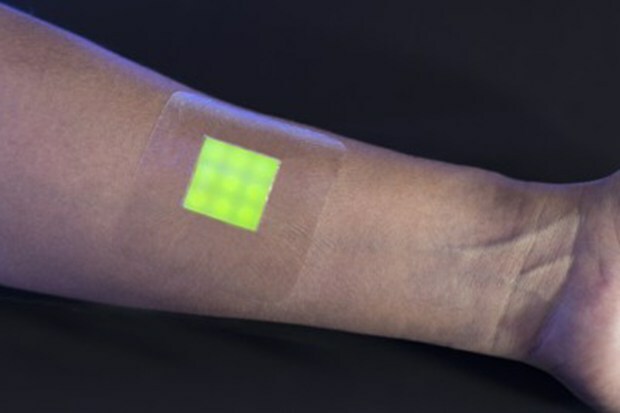 Scientists at Bath Uni have developed a neat novel wound dressing that fluoresces when the early signs of an infection are present. The concept is simple: a gel containing tiny sacs of dye are included in a hydrogel dressing; if cytotoxins that are indicative of bacterial infection are present, they lyse the sacs and release the dye, which fluoresces under UV light. This is fairly early stage laboratory based research, so clearly studies on humans are the next step. I was more convinced by the pig skin model than by the hard surface biofilm models. But this is still a long way from a living, breathing human being! The authors evaluated only S. aureus, E. faecalis and P. aeruginosa, which is a sensible choice covering most bacterial wound infections, but this dressing would need to be pitted against infections with other bacteria. This will only ever be a rapid guide for therapy, not a gold standard tool to diagnose wound infection. In support of this concern, it was interesting to note that the E. faecalis ‘infected’ dressing hardly fluoresced at all in the lab biofilm tests. It is reassuring that the pig skin model show a stronger performance for E. faecalis infected wounds, but even here, E. faecalis produced fluorescence less rapidly than the other pathogens. There is a risk that an infection that for some reason does not trigger the wound dressing colour change would have a delay in treatment, if there is an ‘over-reliance’ on this sort of technology. I agree with the authors that this study provides enough proof of concept for human trials, which I will look forward to with interest! ← Is it true that I have to finish my antibiotic treatment as prescribed? Dressing colour change doesnt indicate the presence of infection but the change in the colour of skin around the wound does.